The Ink Trap: Goldie Golfer at Art Impressions! Hey, all! Welcome to 2014! It's a new year, a fresh start, a blank canvas. So many possibilities. One of my goals in the new year...to get more sleep. Unfortunately, I'm off to a bad start. It's 2am here in the Land of Enchantment and I'm completely engrossed in the Girls marathon running on HBO. Why have I not been watching this show? Anyhoo, I have a card to share. 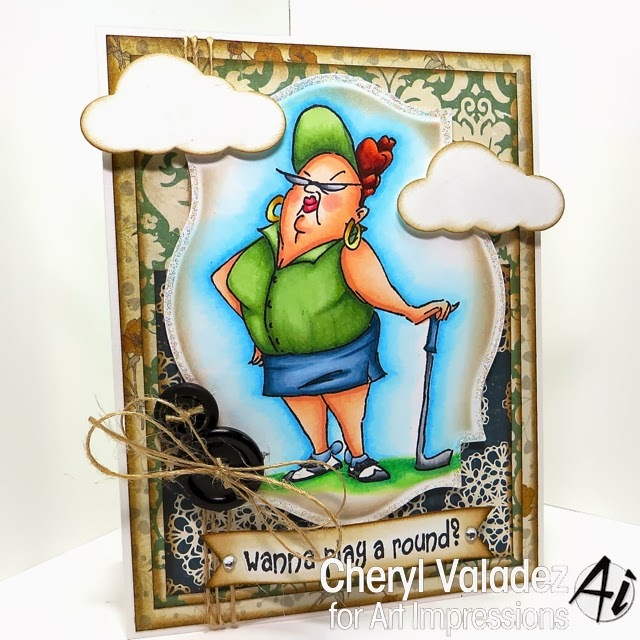 This sassy Lassy of the Links is Goldie Golfer (#4324) and she's available in the shop at Art Impressions. She's quite confident, as you can see ;) Visit the Art Impression blog for new inspiration daily. Ok, I'm going to keep this short. I'm only going to watch one more episode of Girls then I'm off to bed. Really. No, I swear. Crap, I wish this show wasn't so good!